First there was the car accident—two girls gone after hitting a tree on a rainy night. Not long after, the murders happened. Those two girls were killed by the man next door. The police shot him, so no one will ever know why he did it. Monica’s sister was the last cheerleader to die. After her suicide, Sunnybrook High disbanded the cheer squad. No one wanted to be reminded of the girls they lost. That was five years ago. Now the faculty and students at Sunnybrook High want to remember the lost cheerleaders. But for Monica, it’s not that easy. She just wants to forget. Only, Monica’s world is starting to unravel. There are the letters in her stepdad’s desk, an unearthed, years-old cell phone, a strange new friend at school. . . . Whatever happened five years ago isn’t over. Some people in town know more than they’re saying. And somehow Monica is at the center of it all. There are no more cheerleaders in Sunnybrook, but that doesn’t mean anyone else is safe. I am so excited about kicking off the tour for The Cheerleaders, Kara Thomas’s latest mystery-psychological thriller! I read and loved both of Kara Thomas’s previous novels (read my Little Monsters review) last summer and have been highly anticipating her next one ever since. Since this is a mystery, I’m intentional vague about certain parts in this review so as to not spoil the reveals. The Cheerleaders follows Monica, younger sister to one of the infamous dead cheerleaders, as she enters her Junior year and comes across secrets her step father has been hiding about the tragic deaths of the five cheerleaders—and if they all connect. As she dives deeper into mystery, she befriends Ginny, fellow dance teammate who might be hiding her own secrets, and works with her as they unravel what really happened five years ago. 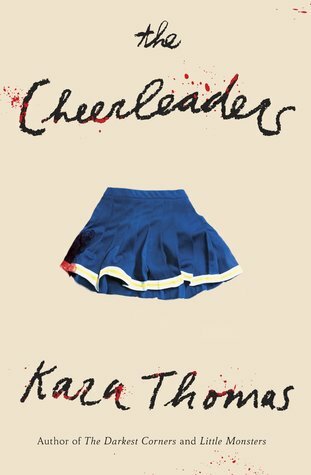 There are so many things that I love about Kara Thomas’s novels, and The Cheerleaders does not disappoint. There’s complicated family and friend dynamics, little-to-no romance, a slow mystery that unravels a little bit clue by clue but that isn’t given away too soon, and an unlikable protagonist that feels like a real person. In her previous novels, the family and friend dynamics are pretty messy, so I was expecting the worse from her parents. However, I was pleasantly surprised to see that both her mom and step-dad loved and cared for her (though there are still complicated parts to their relationships). I enjoyed seeing not only Monica’s dynamics with her friends, but also Jennifer’s in her few chapters. Monica befriends Ginny, who helps her with her grief and the mystery without judgment. While Monica does drift from her best friends, they stick by her side at the end after the final reveal. One of my favorite things about Little Monsters was that there were journals entries from the missing girl that showed her spiraling into a darker state of mind. I loved that Kara Thomas continues this trend in The Cheerleaders by occasionally dropping in a POV chapter from Monica’s sister right in the middle of the murders and leading up to her own death. The timing of these chapters were perfect as they happened after Monica found a revealing clue and I loved seeing how it had actually unfolded in Jennifer’s life as Monica speculated about what had happened. Overall, Little Monsters helped me get out of a month-long book slump with it’s page-turning, twisty mystery. I can’t wait to see what Kara Thomas writes next! Kara Thomas is a true crime addict and the author of THE DARKEST CORNERS, LITTLE MONSTERS, and THE CHEERLEADERS, all published by Delacorte Press. You can find her on Twitter (@karatwrites), Instagram (@kara__thomas), or at www.kara-thomas.com. This is one of my most highly anticipated books of the year!! I hope you have had a chance to read! This book has been getting great reviews. As someone who loves to read mysteries, this is a must-read for me. Definitely a must-read! I loved it and Kara Thomas’s other mysteries! I hope you have a chance to read it soon! I’m so excited for this book as I have loved Kara’s other books!! She’s definitely and auto-buy author for me! Me too! I always look forward to her next mystery! Same! I love how simple it is! I think Little Monsters is my favorite Kara Thomas book! You’ll definitely love both of them if you love thrillers!